By Rod J. Colvin, M.S. Were American service men still being held as prisoners of war in Vietnam and Laos? First Heroes untangles an intricate web of information and concludes that POWs were still held captive long after the war had ended. Reports of Americans in jungle prisons, cases of missing men, Vietnamese motives—these are all parts of the puzzle pieced together by the author. And First Heroes answers other questions: Were some of these men deserters? Why didn’t any escape? 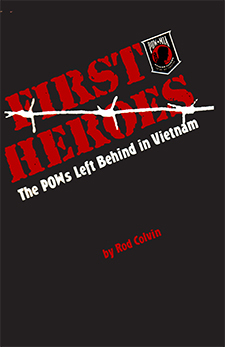 Rod Colvin has produced a carefully researched work that points no fingers of blame…rather clarifies, uncovers, and informs. His book balances hard facts with dramatic personal accounts of the parents, wives, brothers, sisters, and children who waged a tough battle for the truth about their loved ones. The MIA families kept their vigil, even when a war-weary nation wanted to forget. First Heroes is as much a testament to their faith and unending hope as it is the story of the men themselves. First Heroes will change the way you think about war, about freedom—and about your country.